A fun and popular New Year's activity in Japan is going on a short pilgrimage to honor the seven lucky gods, a traditional symbol of fortune for the new year. New Year's weather is usually fine, lending itself to a little outdoor jaunt and these walks are relatively short -- usually taking only a few hours. The tradition began during the Edo Period (1603-1868) as a way to secure good fortune for the coming year by completing the pilgrimage early in the new year. There are over 200 such pilgrimage courses across Japan. This year, I recommend one in Tsurumi, a northern ward of Yokohama. 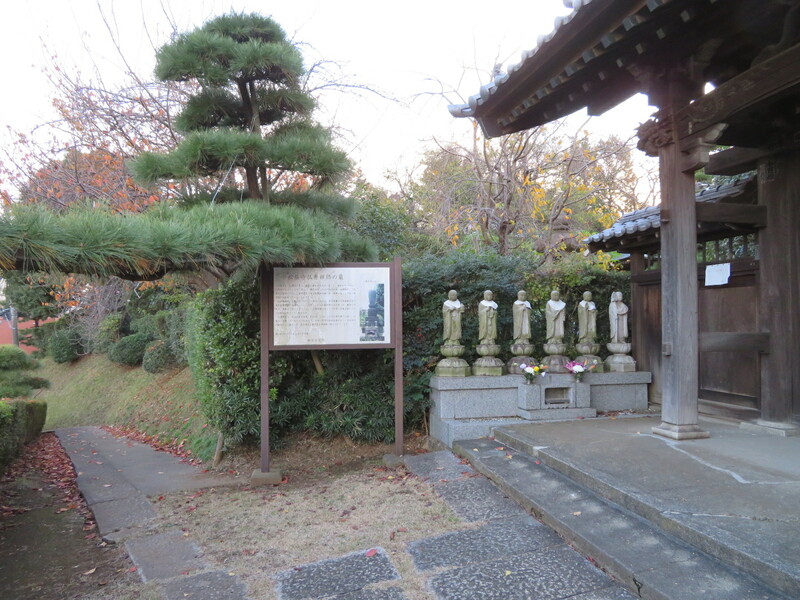 Much of the route travels along or near the old Tokkaido road, one of the historic roads linking Kyoto and old Edo (now Tokyo), and takes visitors to small obscure shrines and temples as well as a major religious center. This is an area off the beaten track for foreigners, but easy, accessible, and historic. The walk can be completed in less than three hours, although you may want to devote the entire day to give yourself time to stop and enjoy other sights along the way. I've prepared a map to help. Most pilgrimages offer pilgrims the opportunity to acquire a memento of their journey. For this pilgrimage, from Jan 4 through Jan 12, 2019 (9 a.m. to 4:30 p.m.), you can purchase a printed sheet at your first stop for the modest investment of 100 yen. At each of the seven destinations, there will be a special stamp that you then stamp across the printed name of that shrine or temple, evidence that you have been there (no additional charge). Don't worry that it's in Japanese -- an attendant or your fellow pilgrims will help you stamp over the correct name at each location. 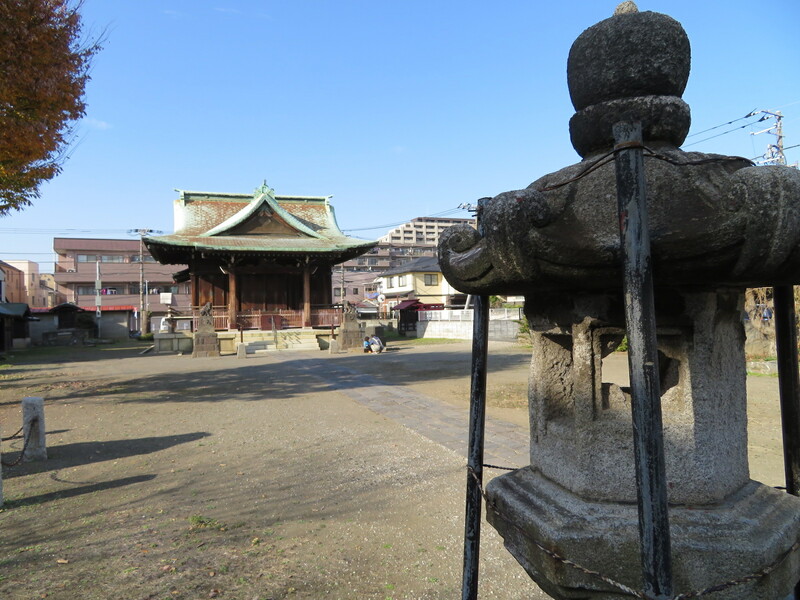 Tsurumi sits between the old Tokaido post towns of Kawasaki and Kanagawa. 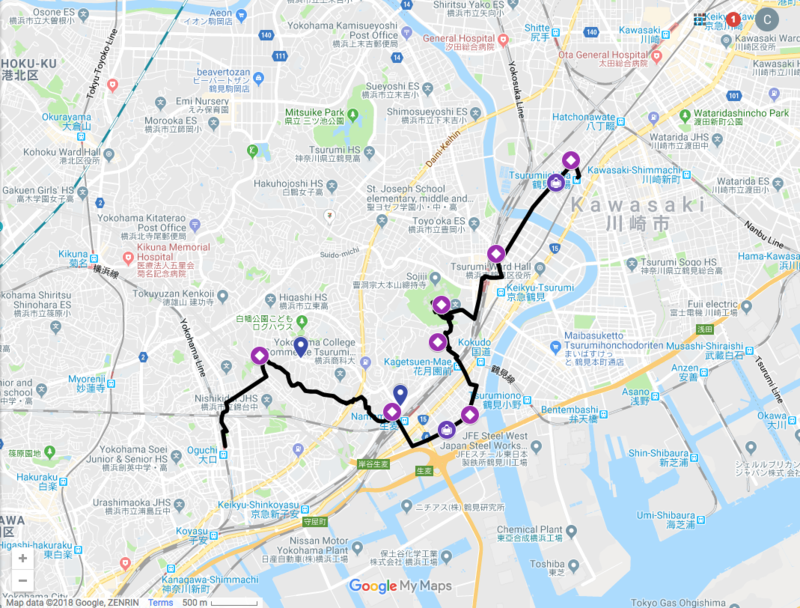 This walk begins from Keikyu Tsurumi-ichiba station (17 minutes from Shinagawa or 13 minutes from Yokohama by a combination of express and local trains). Turn left as you exit the station and cross the tracks. 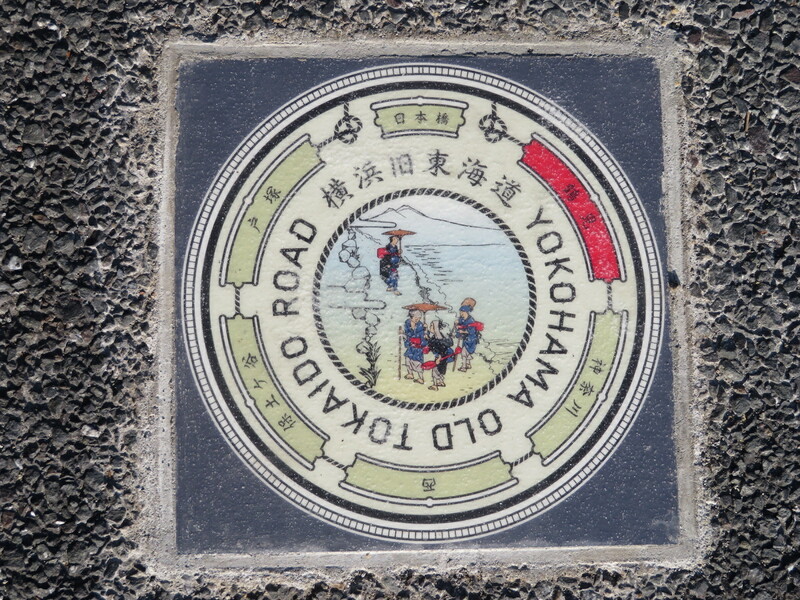 Your first destination, Yokohama Kumano Jinja is just 100 meters down this road. This shrine, which dates from the ninth century, is a satellite of the Kumano Shrines associated with the Kumano Kodo pilgrimage in Wakayama Prefecture. Here you will collect a stamp for Fukurokuju, the god of happiness, wealth and longevity, the first of your seven stamps of the day and the perfect god to see you through the rest of your walk today. The road that runs past the shrine is the old Tokaido itself. Follow this in the direction of Yokohama. In about 280 meters, on the left-hand side of the road, you’ll see a bronze marker and a small shrine. This is the ichi-ri-tsuka mound of Tsurumi Ichiba. When the Tokaido Road was constructed in 1604, the government built mounds every one ri (an historical unit of measure covering about four kilometers) to help travelers gauge their distance from Nihonbashi in Edo. This mound marks five ri from Nihonbashi and is your first taste of the history of this old road along this walk. The next sign of the Tokaido is a marker embedded in the sidewalk shortly before you reach the graceful suspension bridge crossing the Tsurumi River. This quiet spot in the river is a popular resting spot for waterfowl. See how many species you can spot. After crossing the bridge, the neighborhood gets busier as you enter Tsurumi itself. 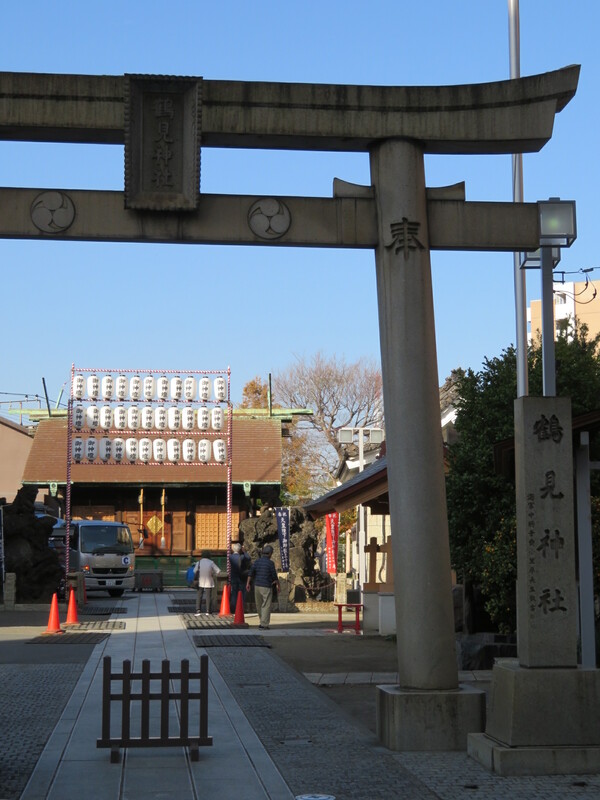 Just after crossing Route 14, turn right at the laneway and you will see Tsurumi Shrine in front of you. This venerable shrine is said to date back to the beginning of the seventh century and seems to serve, these days, as a repository for various monuments collected from the surrounding area. Be sure to check out the small satellite shrines along the side of the main temple, as well as the inner shrine at the back. The stamp to collect here is Jurojin, the god of longevity. After you leave Tsurumi Shrine, use the pedestrian walkway at JR Tsurumi Station to reach the other side of the train tracks, then follow the tracks in the direction of Yokohama to reach the tree-lined entrance to Sojiji, a major site of Zen Buddhist learning. This is a complex of multiple temples sitting on 50 hectares of land atop a hill within five minutes’ walk of Tsurumi Station. Founded on the Noto Peninsula in the early 14th century, Sojiji was relocated to Tsurumi in the early 20th century after being destroyed by fire in 1898. After collecting your stamp of Daikokuten, the god of wealth, take a bit of time to explore this beautiful site. There is even a small “treasure house” museum, Tekiteki-an, exhibiting the art treasures of the temple (admission: 300 yen). If you like what you see here, consider coming back another time to try zazen meditation for yourself. English language sessions are offered once a month (details here). Instead of leaving through the temple’s big gate, climb the stairs of the hill on the right as you face the gate. 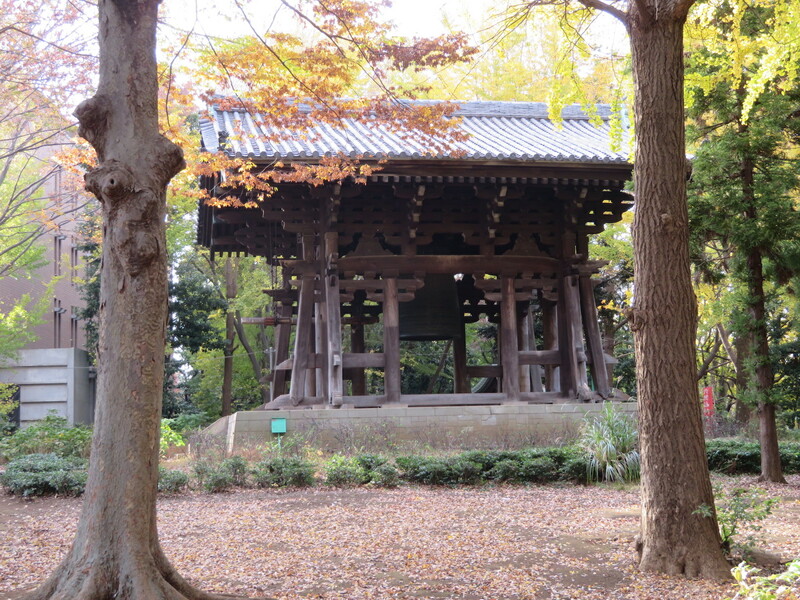 In addition to a Kannon statue and bells dedicated to the victims of the 2011 Tohoku Disaster (ring the bells to pray for their souls), there is an Inari shrine, another small shrine and a beautiful bell. Leave Sojiji by the small side gate just beyond the bell tower and rely on the map to guide you to your next destination, Tofukuji, which sits in a hollow on the other side of the hill. This is sweet little temple has a somewhat murky past. It is believed to have been founded in the early 12th century, but no one knows for sure. Although its principal deity is Kannon, the goddess of peace, this is where you collect a stamp for Bishamonten, the god of war. From Tofukuji, continue down the hill to the train tracks and cross at the level crossing. Continue straight ahead, following the map back to the old Tokaido and turn right to continue in the direction of Yokohama. The Tokaido here parallels the Tsurumi River and was once a bustling fish market. This area is known as Namamugi. 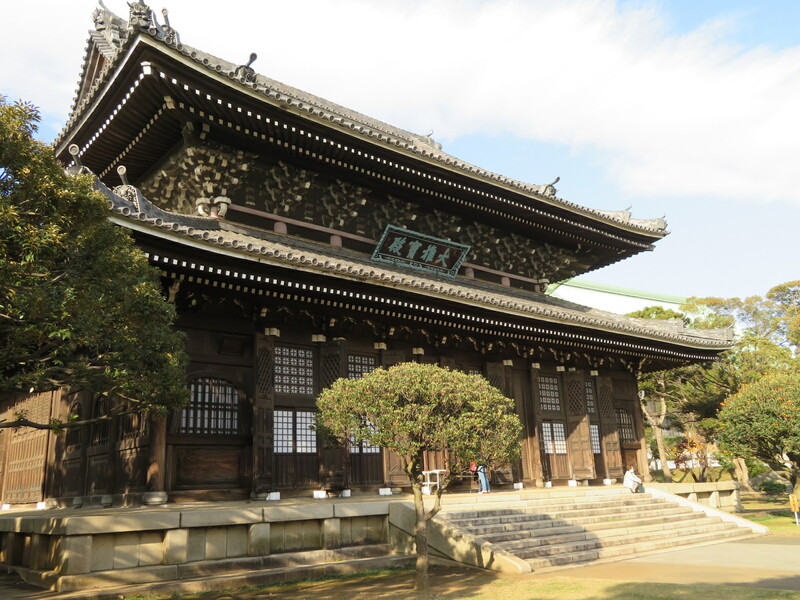 After about 300 meters you’ll come to Shosenji, a small Shingon sect Buddhist temple established in 1624. 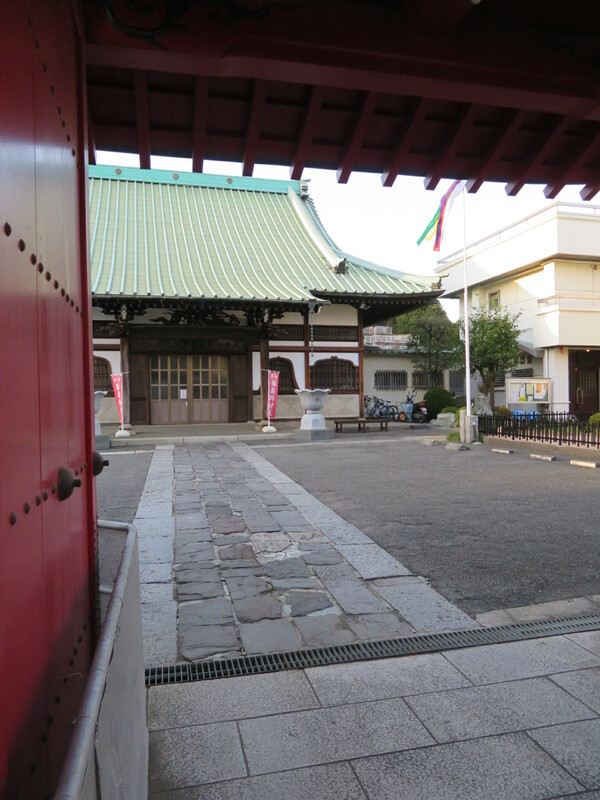 Here you will collect a stamp for Ebisu, the god of fisherman (how appropriate for a temple in this location). Another 300 meters down the Tokaido, on the right-hand side, you will find a plaque marking the site of the 1862 “Namamugi Incident”. On Aug 21, Charles Richardson, an English merchant visiting from Shanghai, was sightseeing with two other Yokohama-based English merchants and another companion when they were attacked by samurai retainers who were angry that the foreigners had not shown sufficient deference to the retainers’ lord, whose retinue was also on the road. Richardson was mortally wounded, dying after he fell from his horse several hundred meters down the road as he tried to flee back to Yokohama (there is a stone marker on this spot as well). The other two merchants were also wounded; only their female companion was unharmed. The British government demanded reparations, as well as apprehension of the attackers, whom they saw as murderers. The incident was a watershed in Japanese foreign relations, contributing significantly to the opening of Japan to the West. Fans of novelist James Clavell's work may recognize these facts, as he borrowed them for the opening incident of his 1993 novel, "Gaijin." Although it is a bit beyond where you need to go for this walk, you may want to go in search of the second marker. Or perhaps after this gruesome tale you need a drink. Just on the other side of the overhead expressway is Kirin Village, a Kirin brewery offering tours, tastings and meals, open from 10 a.m. to 5 p.m. (closed Jan 1-4 and every Monday; Tuesdays when Monday is a public holiday). Consult the map to get back on the pilgrimage route. You’re on the home stretch now as you leave the Tokaido for the last time today. 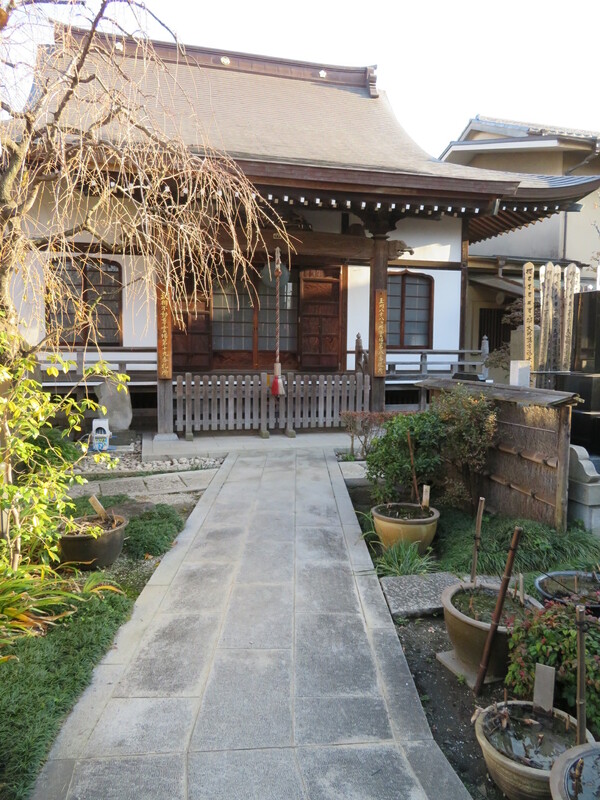 Anyoji temple is on the other side of the JR tracks, just 350 meters from the Tokaido. 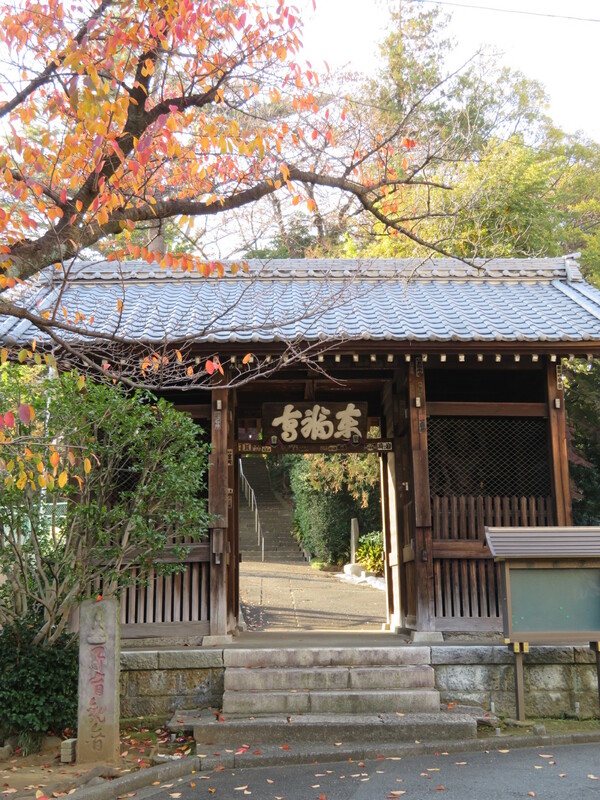 Founded in 1500, this temple was a common side stop for travelers on the Tokaido, as witnessed by the six statues of Jizo (guardian of children and travelers) inside its gate. At Anyoji you can get a stamp for Benten, the goddess of fine arts and literature. She is usually found on an island, surrounded by water, but there is no water to be seen at this temple. 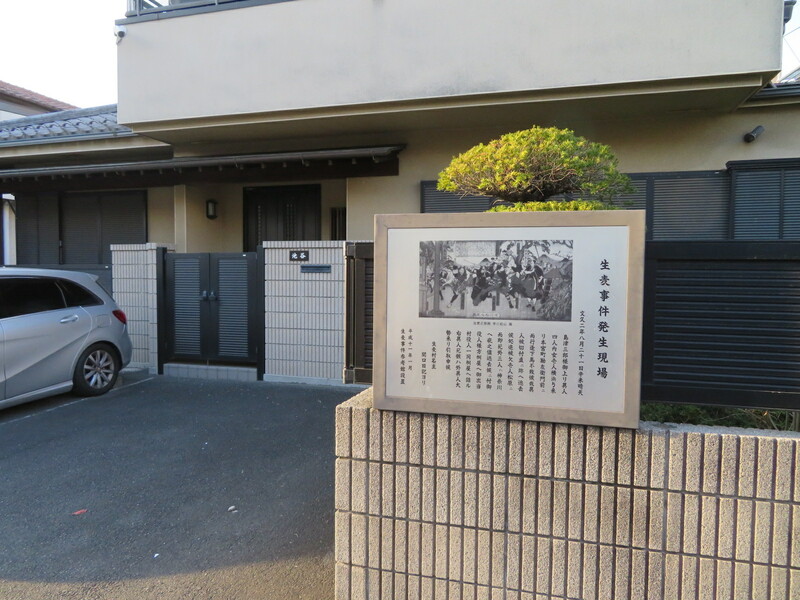 From Anyoji to Shoinji -- your final stop on this pilgrimage -- is about a 25-minute walk through interesting residential neighborhoods (follow the map). If you’re already feeling a bit footsore, you can catch a #41 bus from the bus stop marked on the map, getting off after 16 minutes at Shirahata. From there it’s just a few minutes up the hill to Shoinji, a hilltop temple with a lovely late afternoon atmosphere (remember, in this part of Japan, it’s late afternoon around 3:30 p.m.). Shoinji was founded in 1334 and is affiliated with Kamakura’s Hase-dera. Your seventh and final stamp is Hotei, the god of happiness and contentment (and alcohol). Now that you’ve collected your seven stamps, you’ve completed your pilgrimage. The nearest station is JR Oguchi, a 15-20-minute walk down the hill from Shoinji, through interesting residential neighborhoods and along a pretty little canal. Relax and enjoy this final stroll, secure in your fortune for 2019. Vicki L Beyer, a regular Japan Today contributor, is a freelance travel writer who also blogs about experiencing Japan. Follow her blog at jigsaw-japan.com.